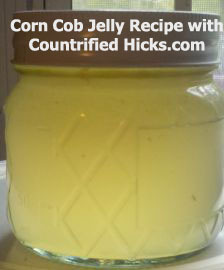 Corn Cob Jelly is a food that has been around for a long, long time. Our ancestors knew how to use and reuse so many items that we just throw away. One of these items was the corn cob. Once you get through with eating a piece of corn-on-the-cob, save the cob next time. We freeze ours in a baggie until I have enough to make some corn cob jelly. Try it sometime and you will become a fan also! As you can tell by my photo, the cobs do not have to be picked clean to use. After we eat the corn, I just stick them in the baggie in the freezer. When I am ready to make the jelly, I just pull them out, break them in half (so they will all fit in my pot) and start cooking! Put the cobs in a pot, add the water and turn it on high to boil. Once it begins to boil, let it boil (a hard boil) for 30 minutes. At this point, prepare your jars by either running them through the heat cycle of your dishwasher; boiling them for 10 minutes; or putting them in a warm oven for 15 minutes. Also, put on a pot of water to boil for processing. Once the cobs have hard boiled for 30 minutes, place a colander or strainer over another pot and strain the cobs and water. The water that is now in the bottom pot will be used (prepared liquid). Set the strainer/colander of cobs aside. Measure the liquid. I usually have 4 cups of prepared liquid at this point. After measuring, pour the liquid back into either pot and add in the lemon juice, butter and pectin. Turn on the stove to medium-high and bring the liquid to a boil. Stir occasionally. As it is cooking, measure out the sugar. You will match sugar-to-liquid equally. If you had 4 cups of prepared liquid than use exactly 4 cups of sugar. OK? Once the mixture is boiling, stir in the sugar. Stir constantly. Let it come back to a full boil and boil for exactly one minute and remove from heat. Begin ladling the hot jelly into jelly jars, seal and process in water bath for 10 minutes. Here is what it looks like when done. Isn't it pretty? Now for the corn cobs we set aside earlier, I just leave them out and let them dry out and then store them until I am ready to do a campfire and use them for kindling. They burn nicely! This will make 6 half-pint jars. This Corn Cob Jelly tastes great on my potato biscuits. If you would like to learn more about canning, click here to go to my Dehydrating & Canning page. I recently learned about Bioscience and their Weight loss challenge. I am a BIG gal and have struggled with my weight my entire life. I have tried lots of diets and even doctor prescribed medicines and plans and never really lose more than 2-3 pounds. My body just won't release the fat. I haven't dieted in YEARS because what is the use, right? Well, I heard about this challenge and I was thinking "What do I have to lose?" Nothing but weight, right. So, after checking out the site, I decided to try the 30 Day Diet plan. I liked the description of the product where they say they don't try to make you just eat cabbage soup or try to shame you into weight loss. I really liked the fact that all the products are made here in the U.S. and are made at FDA inspected facilities. My goal is to actually lose some weight. I would be happy with a loss of 5 lbs. a month but would really like to lose at least 10 lbs. a month. Wouldn't that be great? If you want to learn more about the company, it is Creative Bioscience. If you would like to order the 30 day Diet Plan like I am going to try out, click here or here. Once I get the plan, I will let you all know and keep you posted on the results. I am excited!